Christmas has finally arrived in the Edward household! I am not sure about you, but there is something so magical about this time of year that I have to resist the urge to put up the decorations before December 1st! Everything displayed, apart from otherwise stated are all from my local garden centres. I can’t recommend venturing out to your local businesses enough. It’s easy enough to wander round huge retailers, and believe me because I love it too, but to know your buying locally, is really worth while for both yourself and the keeping locale businesses alive. To ensure your home doesn’t turn into Santa’s Grotto, I really recommend using the same colour palette as the room you are giving a Christmas sprinkle to. 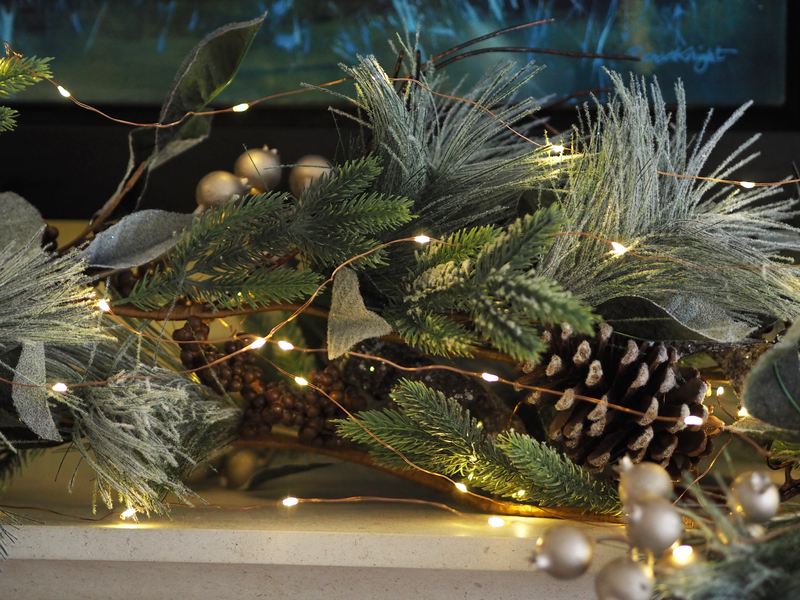 I chose a neutral wreath with glitter dusted pine cones to give a hint of sparkle in a very calming room. 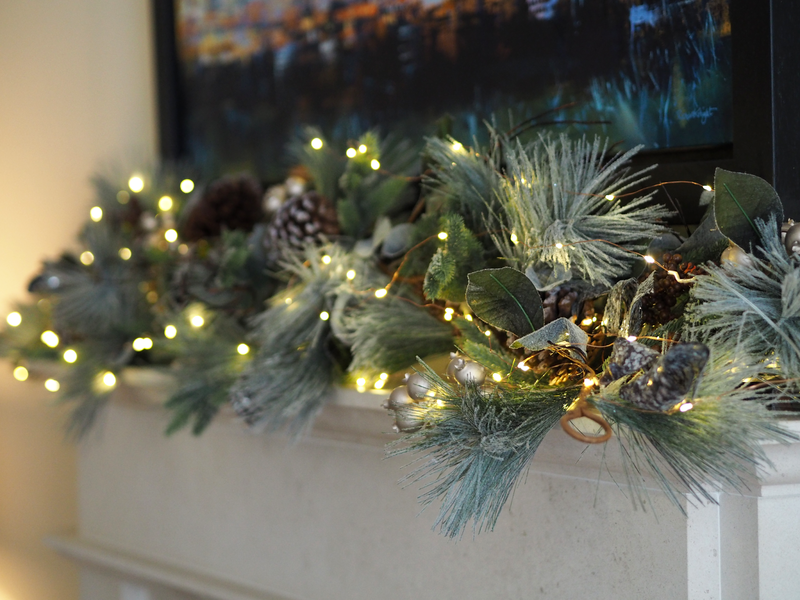 This will ensure your decorations look part of the room, rather than something you have plonked on the fireplace with no thought at all to. Equally, if you have silver light fittings, plug sockets, frames etc etc.. match your decorations to the hardware to avoid clashing finishes. When it comes to decorating the Christmas tree, lights should form the foundation. This is so important to ensure you create enough depth to the tree. When I do the lights, I ensure I go right into the trunk of the tree and work my way out, ensuring most of the branches have a scattering of lights on them. If you just dance around the branches, the inside of the tree wont be lit and it will loose its dimension that makes the Christmas tree look full and glittery. 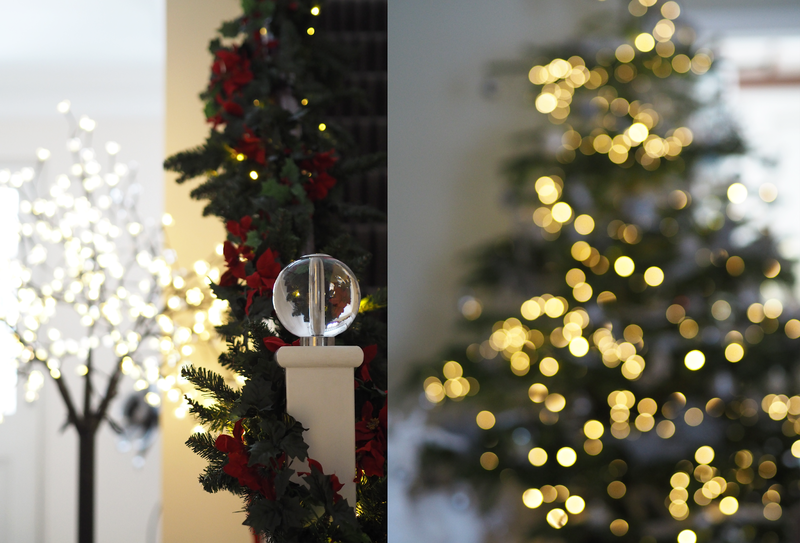 To ensure you haven’t left any huge dark spots in the tree, step back and squint your eyes, this way you will clearly be able to see where you need to place more lights. Now I have to touch upon this. Christmas is the time for spending time with family, so when a loved one can no longer spend Christmas with you, it really brings home how much you miss them. 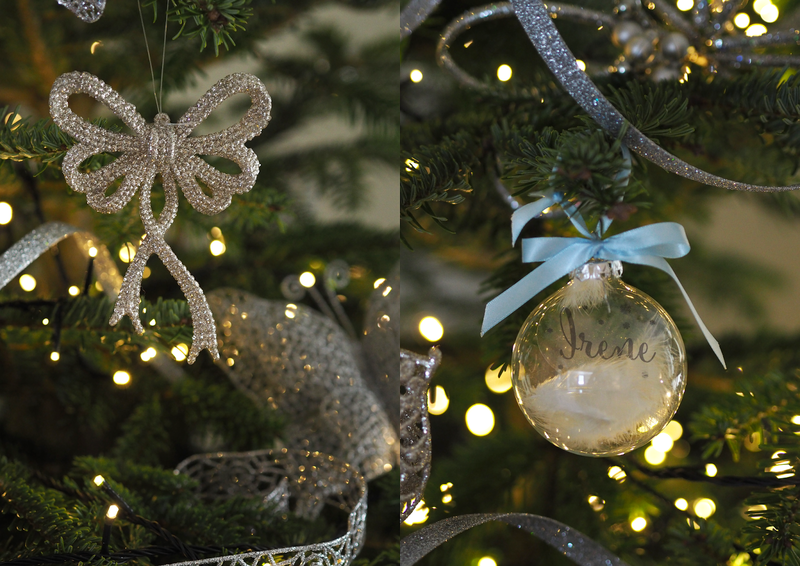 Last Christmas, my sister realised it was the first Christmas without my Grandma, so made a special effort to pay homage to her, with a gorgeous personalised bauble. To many, it may look tacky, but to us it’s a way of showing that we still think about her when Christmas comes around. Yes, I love all the glittery, fancy, classic, chic baubles that dress the tree, but this one will forever be my favourite and I recommend you have at least one personal touch to make Christmas, your Christmas. Now, I know Christmas decorations can be pretty expensive, so try and cut corners where you can. You can get already lit wreaths to go down your banisters or to sit on top of the fireplace, but these can be pretty pricey, so to save some pennies I bought two battery pack fairy lights from Amazon and placed these in between the leaves of the wreaths, giving just enough twinkle to the fireplace and stairs without breaking the bank. I hope these top tips helped and I hope you all have a fabulous Christmas, however you choose to spend it. Labels: Christmas, Christmasdecorations, christmastree, Decorations, holidays, Home decor, how to decorate your christmas tree.